The PIXMA IP6000d Photo Printer is a powerful new tool for the advanced photographer who is looking for exceptional quality, versatility and control. 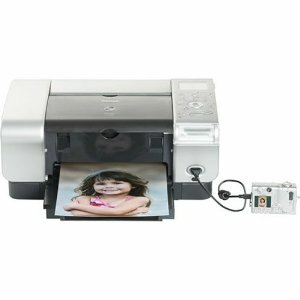 The IP6000d allows you to take advantage of the Easy-Photoprint software. This software will empower you to fix, sharpen and enhance your photos. There is a large 2.5 inch built-in LCD and control panel. With this you can visualize the print process and fine-tune your image for a better print result, with or without a computer. Customers report that this printer delivers. Be aware that the USB cable needed for connection to your computer does not come with the printer.